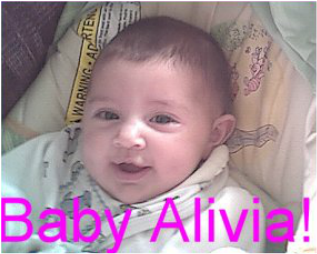 Alivia Marie Belmares was born Jan. 5, 2003. She fell asleep in the Lords arms April 16, 2003. The last day we spent with Alivia, her Grandma said "she’s just like a little angel, isn’t she?" My reply was "yes, she is a little angel" as I kissed her one last time before walking out the door for work. We always knew she was an angel, we just never knew how close to the truth we really were. We could not have asked for a better baby than Alivia! She was always happy and content. She loved her daddy and her big brothers so much. Every time she heard there voices she would turn and look to see them. The boys ask about you or remind us that your gone everyday. They will always remember their little sister! Daddy is still hurting as much today as the day you were taken right out of his arms. He loves you more than any one could ever know. You were daddy’s little girl, his little mammas. Mommy can’t stop thinking about you, I tell you good night on my way home from work every night. I can’t touch you, or kiss you, or tuck you in, but you know I’m there with you. We all love you Baby Alivia and we’ll always have you in our hearts till we meet again.